why isisnt Randall boggs the world boss in monsters inc? does kh3 have a second mission for all worlds? I know we are all excited over the Kingdom Hearts 3D [Dream Drop Distance] news we've been getting since December, but I think sometimes it's nice to take a step back from the present and look to the future. Where will we be going from here? We already know almost half of the worlds that will appear in Kingdom Hearts 3D, and once we know the rest we'll be left wanting more from the series like always. In order set fire to that world-craving desire all of us Kingdom Hearts fans get, I'm going to present to you my list of the top three Disney movies I wish to see in Kingdom Hearts III! Once you're done reading, come chat about my world choices and of our members on the forums! The 2007 film based on the book A Day with Wilbur Robinson by William Joyce has gained a lot of mixed reviews since its release. Some love how cerebral, witty and humorous characters like Lewis and Wilbur are, while others hate how the film seems to jump from place to place with the impatient and hyperactive family that never seems to slow down. It is a film that you can either love or think is just okay, but one thing most reviewers could agree on was that Meet the Robinsonswas moving in the right direction for Walt Disney Studios. 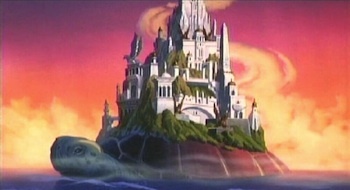 Ever since the "failures" of Treasure Planet and Atlantis: The Lost Empire(neither of which are considered failures by Disney fans, and have since become cult favorites among the fandom), Disney seemed to have stop delivering hit films and tried to shift their marketing strategy on films that contained less Disney Magic and more child-appeal. They felt kids weren't looking for smart stories with an underlying moral meaning, so they seemed to start making films more for the humor and novelty than for story or memorable characters Disney fans were so used to. It seemed like Disney was going to allow itself to fall into a spiral of awful storytelling and trivialities people didn't care about. Then Meet the Robinsons came out and people could see a glimmer of hope. The movie's motto was "Keep Moving Forward", a small line from a famous Walt Disney quote that seemed to also extend to the company's own future. It appeared that Disney was ready to move forward; away from their movie failures and start going back to where the heart of the Disney was at. 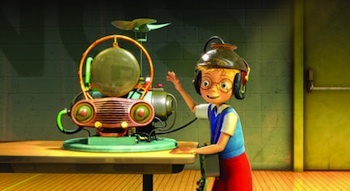 With Meet the Robinsons, they were aiming towards a future filled beautiful unseen worlds of magic and wonder, adventure and friendship, and hope. The movies plot is centered around Lewis, an orphaned genius inventor who seems to scare off all of his potential adoptive parents and believes only his real mother can love him for who he was, and Wilbur Robinson, a time-traveling teenager who sorta-kinda-accidentally lost his father's other time machine and needs to get it back before the future is changed for the worse. Lewis creates a machine to help him remember the faces of his mother and enters it into his school's science fair, where he meets Wilbur who introduces himself as a "time cop from the future" looking for a "bowler hat guy" who stole a time machine. Soon after the entire fair turns to chaos as Lewis' memory machine malfunctions and wrecks everything. Having given up hope, Lewis flees the science fair just before it is revealed that the Bowler Hat Guy and his robotic hat Doris had sabotaged the machine so he could steal it. Meanwhile, Wilbur goes to find Lewis in order to make him repair the memory machine but Lewis only agrees if Wilbur can prove he's from the future. Of course, Wilbur does (how could he resist showing off something so cool?) 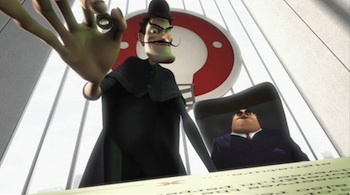 and Lewis finds himself thrust into an amazing journey in the futuristic home of the Robinsons as well as a heroic mission to save the future from complete destruction by the hands of the Bowler Hat Guy and his scheming hat. Wilbur, who doesn't exhibit many character flaws besides teenage neglectfulness and a disregard for safety, would probably benefit from hanging around Riku. Sora seems the type who would gleefully go along with Wilbur's brand of insanity, but Riku is more likely to provide Wilbur with some well-needed advice when he needs it and to be around to get him out of a sticky situation. Likewise, Wilbur would also be there to loosen Riku up and give him a few lessons in how to be cool. Like anybody can be cooler than Riku. Remember that whole little spiel I had on Disney's brief period of "awful story telling and trivialities"? Well, despite that little bump in Disney's road of greatness, there was a gem of a film that tends to get bashed on more than it really should. Brother Bear, released in 2003, was the third and final Disney animated feature Walt Disney Feature Animation Florida released (the other two films being Mulan and Lilo & Stitch) before being shut down permanently in 2004 due Disney shifting away from traditionally drawn and animated films to computer animated works. 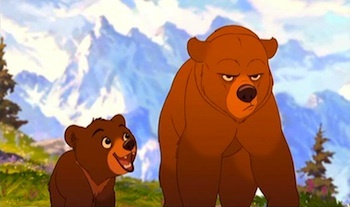 When Brother Bear was first released, people complained on how it was a rehash of the Lion King with its themes of family death, the feeling of being responsible for the death of another, and revenge, and also called it an Ice Age ripoff despite Brother Bear having been in development before the 20th Century Fox animated feature. 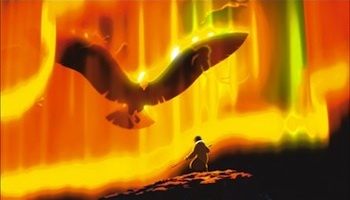 Some reviewers claimed that the movie didn't have the same Disney magic other animated movies had, the very same complaint people had over Treasure Planet and Atlantis. Unlike the those two films which became extremely loved by Disney fans, Brother Bearnever really took off as a cult classic, but it is recognized by many Disney fans as a rather good movie. That's something, right? I have to admit, though, I was a hater of this movie. I was one of those people who had never watched it and continuously refused to because I was afraid to be met with bad movie with an unbearable plot. A few years ago, I pushed aside that fear, sat down to watch Brother Bearand was pleasantly surprised by what I saw. I'm a bit of a softy so it was no surprise I was crying within the first fifteen minutes of the movie over the death of a character I was hardly aquatinted with and would never see again until near the end. In mere minutes, somehow a film I knew I was going to hate turned into one of my favorite Disney films. Brother Bearis a heartwarming tale about young Inuit boy named Kenai who "needlessly" kills a bear after he believed his eldest brother Sitka was murdered by it, and is then transformed into a bear by the spirit of his brother as punishment for taking a life. In order for Kenai to become human again, he must make right the wrong he has committed. Starring beside Kenai is Koda, a young bear cub and son of the mother bear Kenai killed. While the two remain oblivious to the truth of each other's identity, a deep brotherly bond grows between Kenai and Koda throughout their journey. Kenai spends a lot of his time trying to get adjusted to living the life of a bear with Koda acting as his "big little brother", showing him all of the tips and tricks there are to being a bear. During all of this, Kenai's other brother Denahi believes that both Sitka and Kenai have been killed by a bear and has sworn to get revenge. Unbeknownst to Denahi, the bear he is bent on killing is Kenai. It seems that Denahi is perpetuating a cycle of hate and death--perhaps this is the lesson Sitka wanted to teach Kenai. Meanwhile, Kenai is slowly becoming very content with his life as a bear and has become a surrogate brother to the young bear cub, wanting to protect him like his own brothers did for him. His peaceful reality comes crashing down around him when he finds out he was the one who murdered Koda's mother. Kenai runs away, feeling guilty over being the one to make Koda motherless. 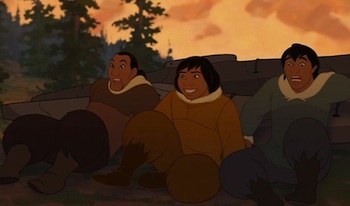 When Koda finds him, Kenai confesses he was the one who murdered his mother which leads into the film's climax. For some people, it is probably extremely hard to imagine a Brother Bear. How can Sora or Riku be placed into the story perfectly enough to where they don't ruin the pseudo-brother dynamic Kenai and Koda have? It is not unlike other Disney movies where it felt like Sora wouldn't fit in with the rest of the cast. Sora seem to have this uncanny ability to fit in while standing out. It is obvious he isn't part of a certain world and not like the characters around him but with his carefree and outgoing attitude, he manages to worm his way into the story's plot as if he was always there. That is why I think Sora would probably spend his time with Kenai and Koda as a bear, traveling the terrain of post-ice age North America. He'd spend his time protecting them from whatever enemies would be around. Riku would do well meeting up with Denahi, possibly trying to aid the warrior in his goal of getting revenge on the bear that killed his brothers. Of course, Riku would learn the truth and try to stop Denahi from killing his brother-turned-bear. Considering the movie has no conventional enemy--I mean unless Vanitas and the Unversed make a return, which could lead to Denahi's anger and hate manifesting into a giant dog Unversed--it seems hard to imagine how the plot could be tied in to the main story. With Nomura's habit of making the impossible seem possible, though. I'm sure he and the writing team could imagine a plot way better than anything I would ever think of. I'm also sure the development team would be able to create a vivid world of ice, snow, mountains, brisk rivers, and green hills covered in fifty-foot tall trees and wildflowers. Of course, I'd just be happy to have the movie just because a story of revenge and death is new territory for the Kingdom Heartsseries. Oh, how we all hate Disney straight-to-home-video sequels. They are almost always bastardizations of beloved movies that were only created to generate extra funds for other projects. More often than not, Disney straight-to-home-video sequels have low production values, horrible characterizations of beloved characters, and boring plot-lines. The stigma surrounding Disney sequels generally makes people want to stay as far away from them as possible. Luckily, the 1996 film Aladdin and the King of Thieves is one of the better Disney sequels created. Actually, it is the last of the Aladdin trilogy based on the tale of Ali Baba and the Forty Thieves from the collection of Middle Eastern and South Asian folk tales, One Thousand and One Nights. While the film takes dips in animation quality more often than not, it isn't bad to look at. Animators seem to have put most of their energy in animating Aladdin and Jasmine's wedding, the Oracle's sequence, and the inside of the Vanishing Isle. Aladdin and the King of Thieves also has an extremely solid and lovable plot. Rarely do animated movies deal actually deal with being reunited with a family member after being abandoned. They also hardly deal with the difficulties of relating to long-lost family members who only wish to use somebody because they suddenly have some kind of worth. The King of Thievesmanages to shine light on a reality that isn't often brought up to children and succeeds in teaching them how to cope, and how to do the right thing when the situation calls upon it. The film opens with the people of Agrabah getting ready for Aladdin and Jasmine's big day, while Aladdin begins to worry he isn't good enough for Jasmine because he never had a father figure to teach him how to be a good man. Amidst all of the excitement and celebrations, the infamous Forty Thieves plan to raid the wedding in search of staff that calls upon an oracle that can answer one question asked to it. Aladdin stops them, and learns of the the staff's powers. With encouragement from Jasmine, the Genie, Abu, and a reluctant Iago, Aladdin uses the staff to learn about the fate of his father. Aladdin finds out his father is "trapped within" the world of the Forty Thieves, which Aladdin misunderstands and believes his father to be an unwilling captive of theirs. With the knowledge that his father is alive and "in danger", he rushes off to rescue his father with a promise to Jasmine that he'll come back and marry her. Aladdin's worries for his father were well-founded, but come to find out his father, Cassim, is the leader of the Forty Thieves. After learning that Cassim left Aladdin and his wife to find the fabled Hand of Midas, an item that can change anything it touches into gold. Cassim began his quest wanting to find the Hand in order to give his wife and son the life he felt they deserved, but years passed and he continued to meet every dead end on the hunt for it. Cassim regrets having left his family all those years ago, which prompts Aladdin to convince Cassim to come back to Agrabah with him and attend his and Jasmine's wedding. Everybody meets Cassim and instantly loves him, but Cassim is restless and, despite how much he loves bonding with his son, decides to continue with his plan on obtaining the Oracle's staff to learn the location of the Hand of Midas. Sa'luk, one of the thieves, rats Cassim's identity out to one of the palace guards in order to usurp Cassim's title and find the Hand himself. Cassim is arrested for trying to steal the Oracle's staff, but Aladdin frees him and begs the Sultan for a second chance for his father. The Sultan does, but it is too late. Cassim has already fled with the staff in hand, but is captured by Sa'luk and forced to use the staff. The thieves and the captured Cassim discover the Hand of Midas is hidden on the Vanishing Isle and leave to claim the treasure with Aladdin hot on their tails. 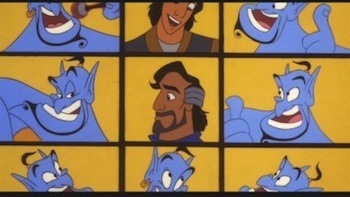 You all may be wondering why I chose Aladdin. "Agrabah is overused! If I have to hear "A Day In Agrabah" or "Arabian Dream" one more time, I'll scream!" 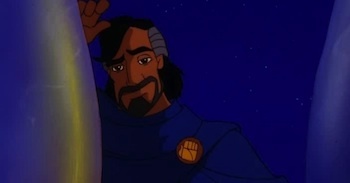 Luckily for all of you, the King of Thievesspends little time in Agrabah or the Cave of Wonders. There would be new locations, and with new locations there is always new music that accompanies it. Don't expect the theme songs of the world to be completely missing from the world; Yoko Shimomura would probably find a way to have the song appear in some way, either from it being remastered or made into a fragment of a song composition. The main enemy would be Sa'luk considering his heart is filled with greed and rage--the perfect candidate to manipulate the Darkness and call upon the Heartless to get what he wants. I imagine Sora traveling not with Aladdin, but Cassim. The King of Thieves is a family man and seems to spend a lot of time in the movie feeling like he missed his chance to raise his son and provide for his family due to his desire for the Hand of Midas. Considering how easy it is for Sora to make people love him and how innocent he is, I think Cassim would view Sora as somebody to protect. He would also respect Sora for his fighting prowess and use that as a way to bond with Sora, the same way he does with his son in the movie. Sora also loves pirates, so I'm sure he'd love the allure of the life of a thief like Cassim. In the end, Cassim could teach Sora how to be sly, and Sora can teach Cassim how to be a father. Also it'd be a nice change up from Sora always being around Aladdin and helping him. On the flip-side, Riku would in well with both Cassim and Aladdin. With Aladdin, Riku would help to reassure him that his father is still a good person despite his lifestyle, and also tell him he is a good man like Aladdin's friends continually do throughout the film. Riku's past experiences give him wisdom that both Cassim and Aladdin need. Aladdin needs to learn how to trust his father, and Cassim needs to learn what is most important in his life. It's impossible for us to know what worlds will appear in Kingdom Hearts III, but maybe you all will consider seeing these movies in the future finale to the Xehanort Saga!